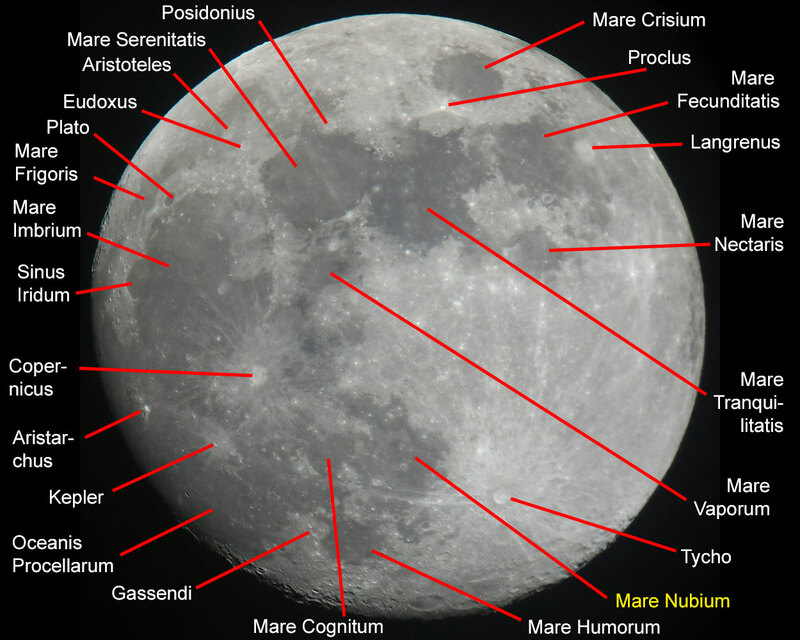 The description of the general elements of the moon surface can be found on page Walking the Moon with my own Photos - Overview. 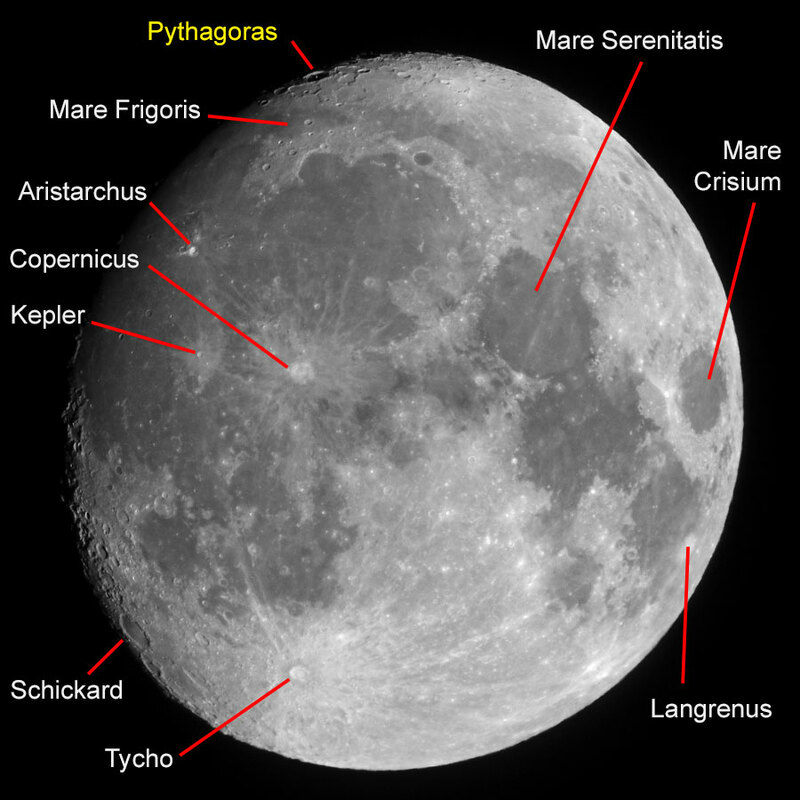 See also pages Moon Alphabet - A-C, Moon Alphabet - D-J, Moon Alphabet - S-Z - Back to the overview of my "moon walks". For more information see the references. 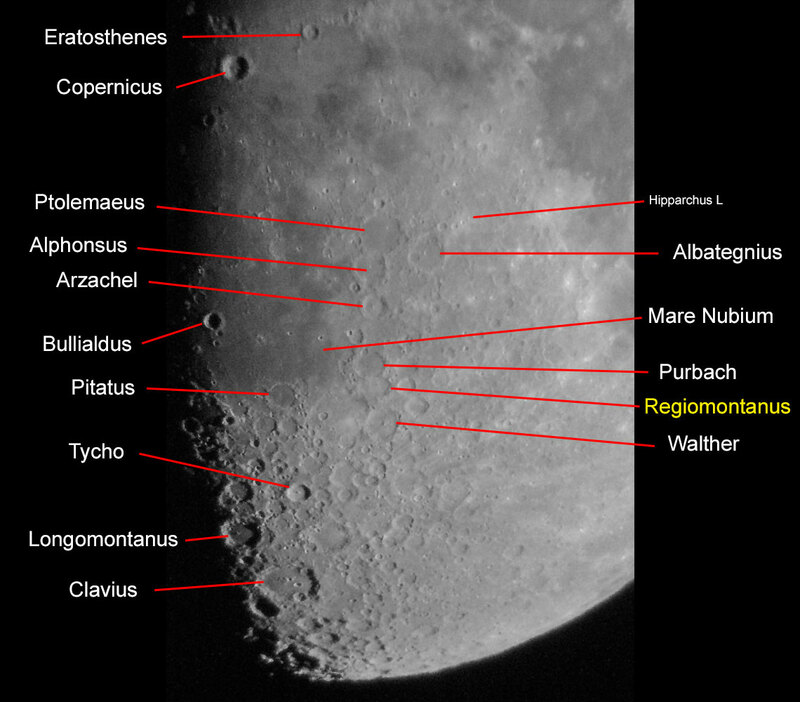 On this page and on a second one, I present landscapes on the moon, surface elements (maria, craters, mountains), or combinations of these in alphabetical order, thus, as a small "moon encyclopedia." The photos are rotated by 180 degrees or mirrored so that they correspond to the normal visual impression, but they are often somewhat skewed. 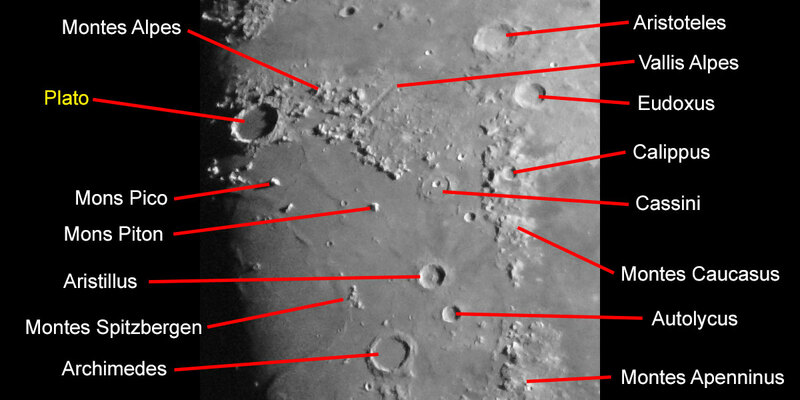 Note: The description of the general elements of the moon surface can be found on page Walking the Moon with my own Photos - Overview. 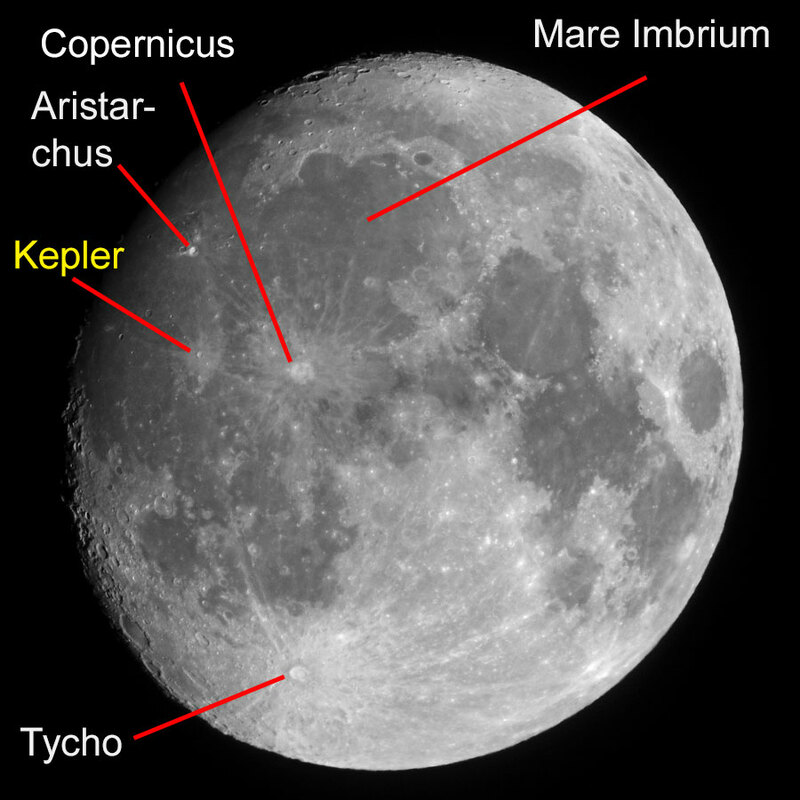 Kepler is a small crater with a diameter of 30 km, but a depthe of 3000 m (Spix; 31 km and 2750 m according to VMA). 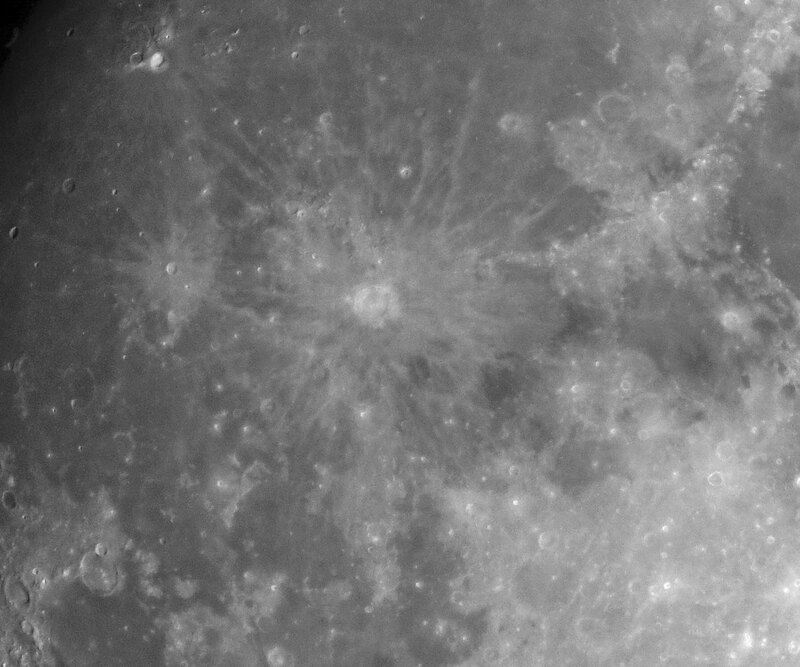 Around the full moon the crater is surrounded by a ring of bright ejected materials. 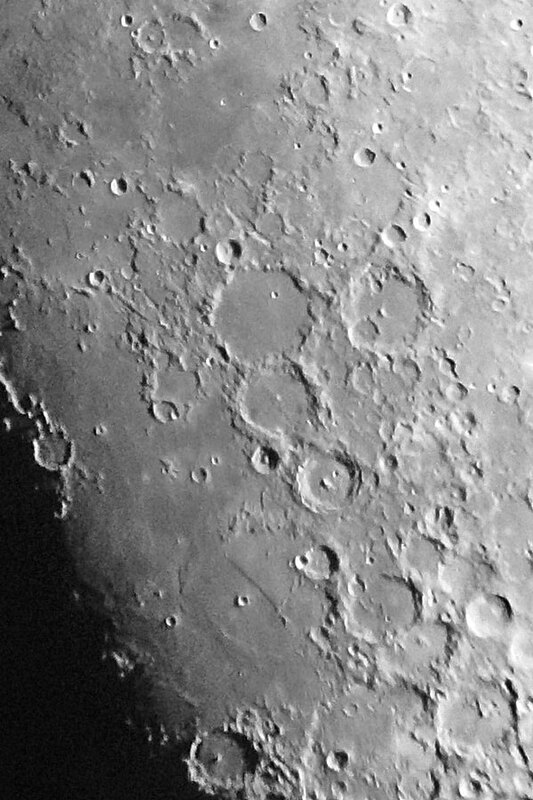 The ring mountains (large crater) Langrenus has a diameter of 132 km and a depth of 4500 m (Spix; 133 km and 2600 m altitude according to VMA); it is located at the eastern edge of Mare Fecunditatis (Sea of Fertility). 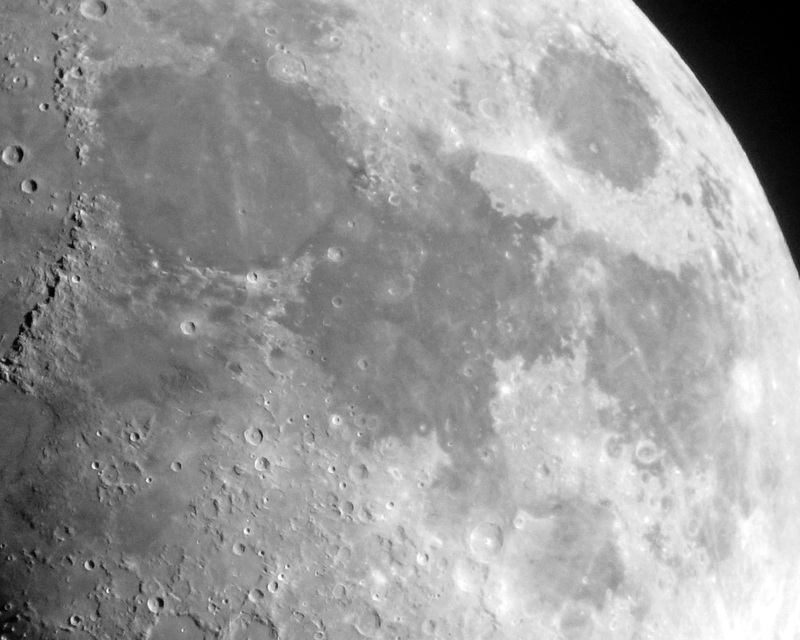 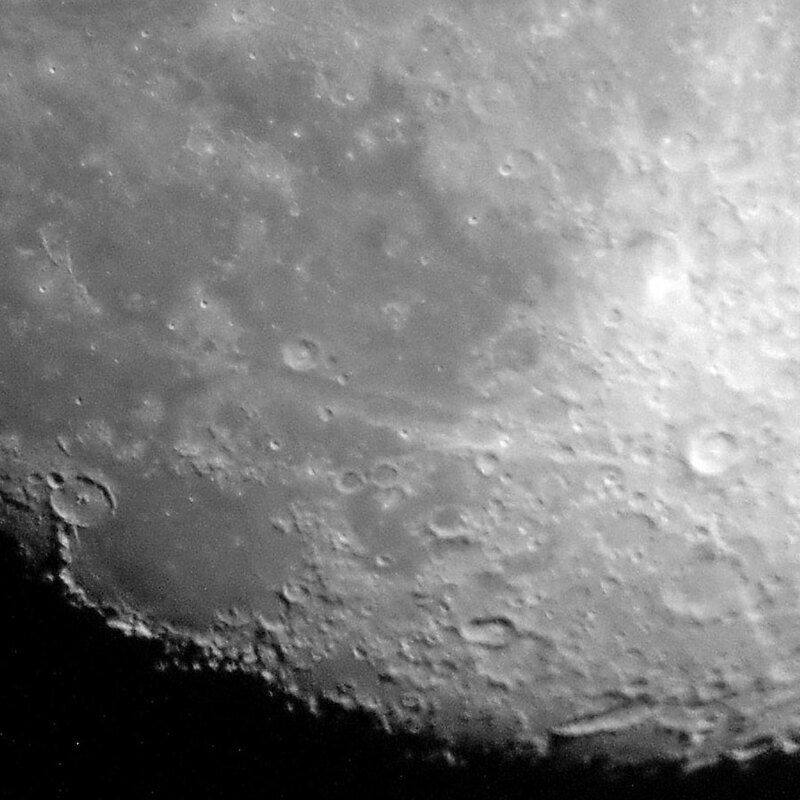 The walled plain Longomontanus has a diameter of 164 km (VMA) and is located in the south of the moon, south of crater Tycho. 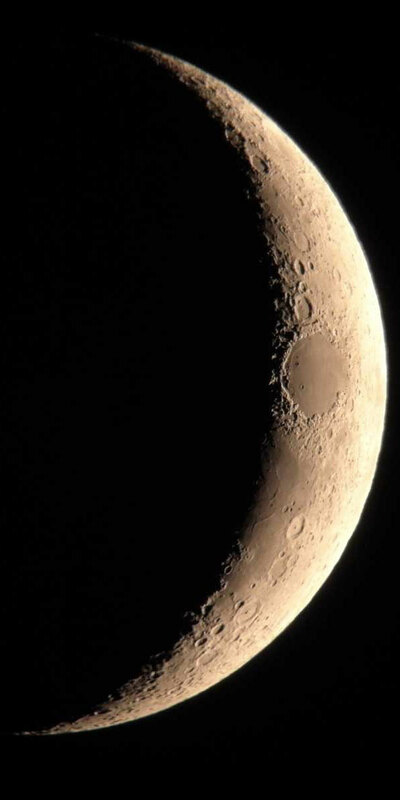 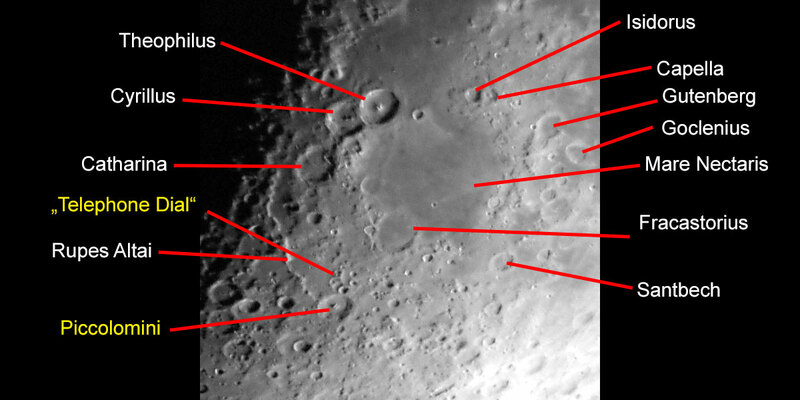 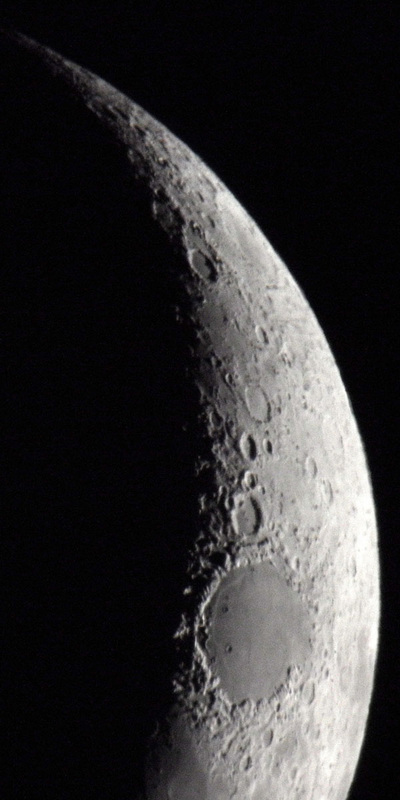 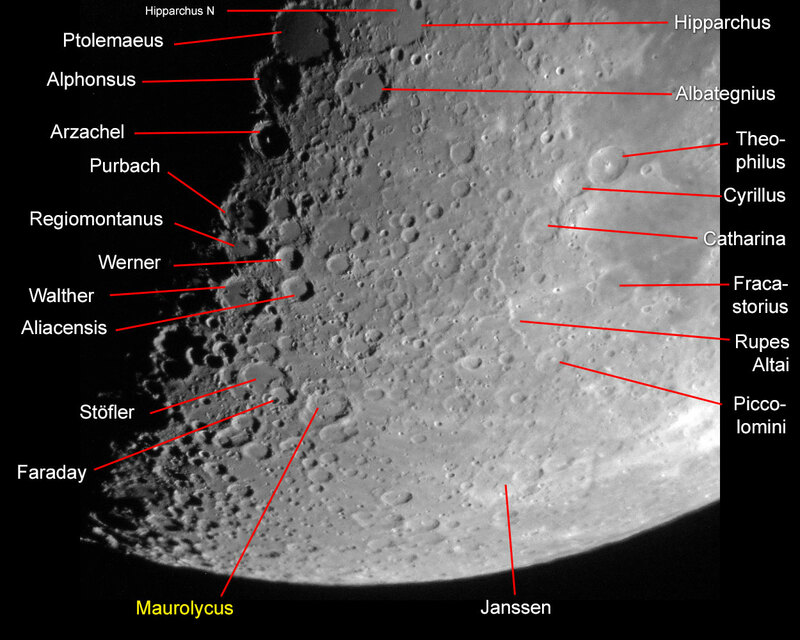 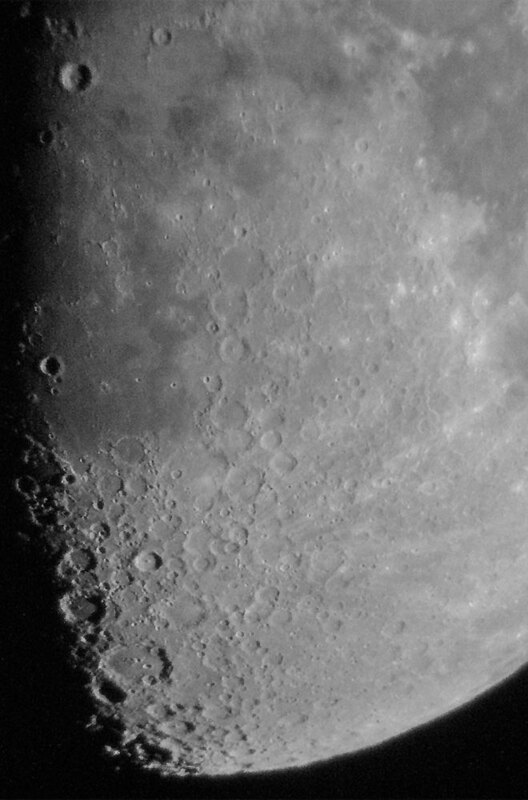 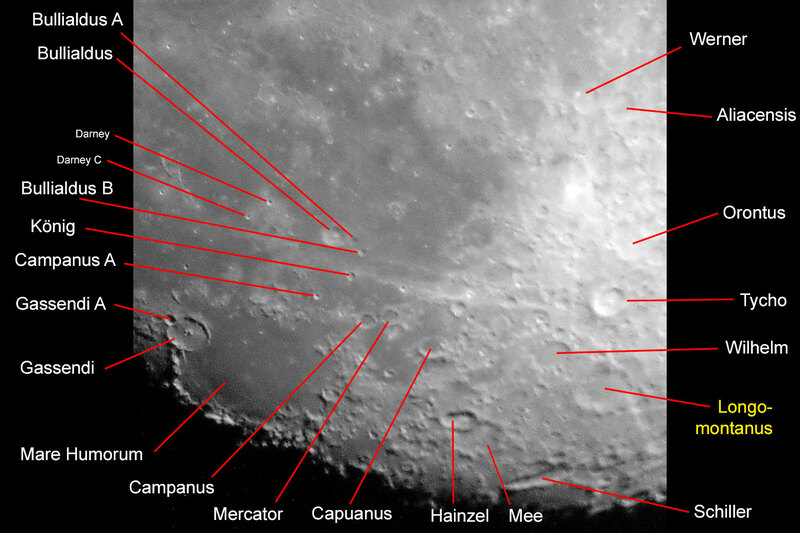 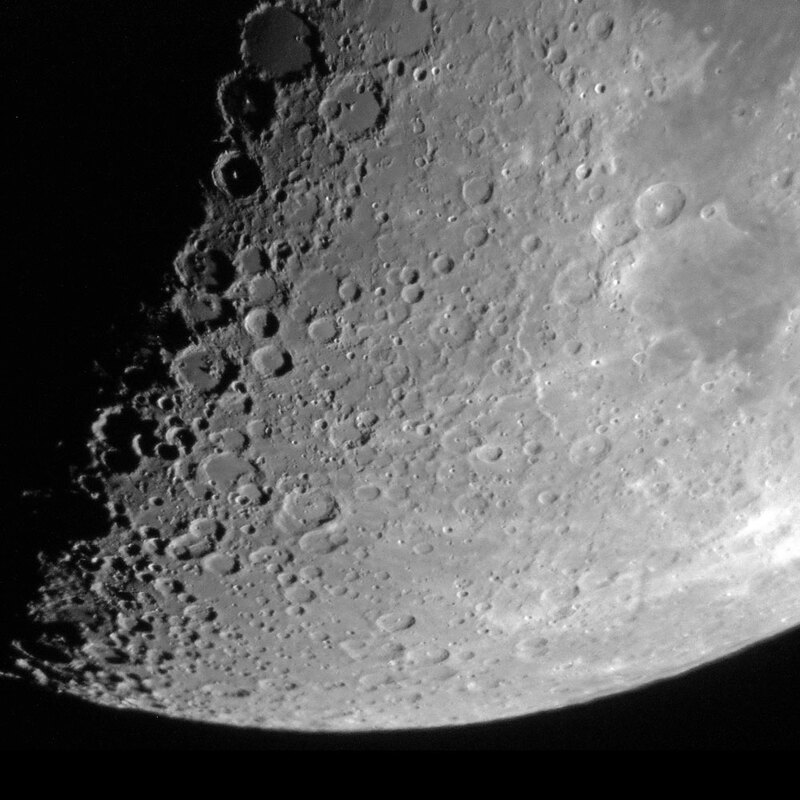 The walled plain (large crater) Maurolycus has a diameter of 115 km and a depth of 4700 m (Spix; 114 km according to Virtual Moon Atlas); it is located in the southern part of the moon (far down...). 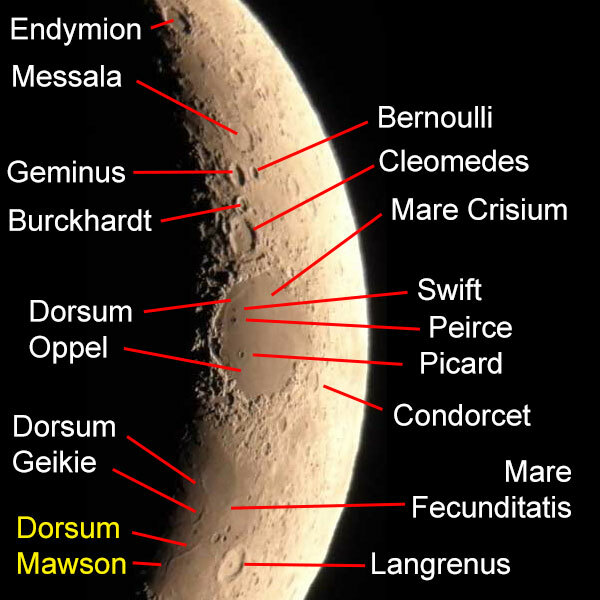 Dorsa Mawson is a group of ridges in Mare Fecunditatis and is approximately 140 km long (S&G). 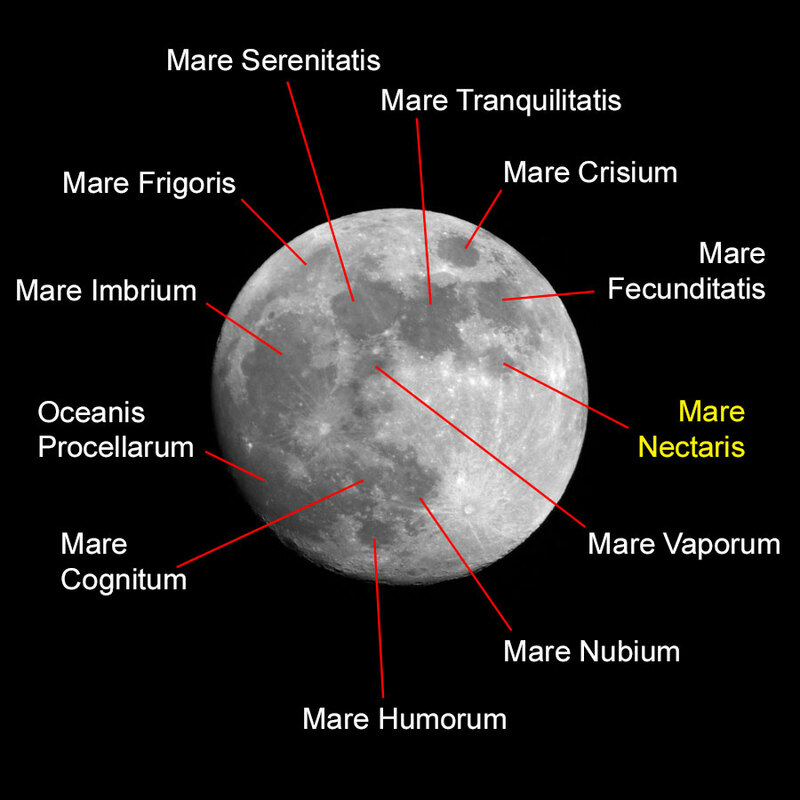 Mare Nectaris (Sea of Nectars) has a diameter of 340 km (Spix). Mare Nubium (Sea of Clouds) has a diameter of 715 km (Spix). 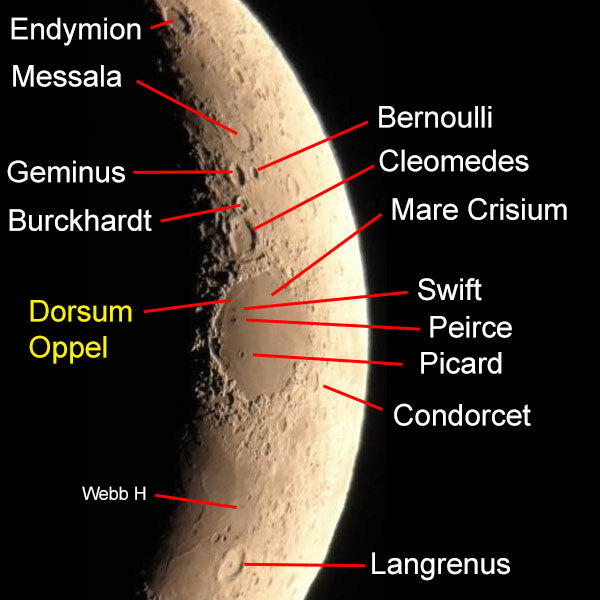 Dorsum Oppel, that is, the ridge Oppel, is located at the western edge of the Mare Crisium and is 300 km long and 100 m high (S&G). 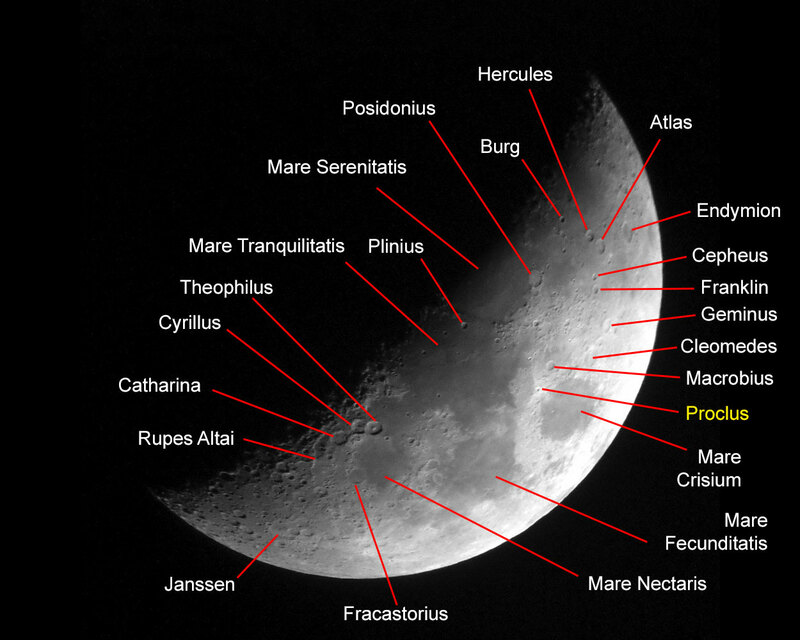 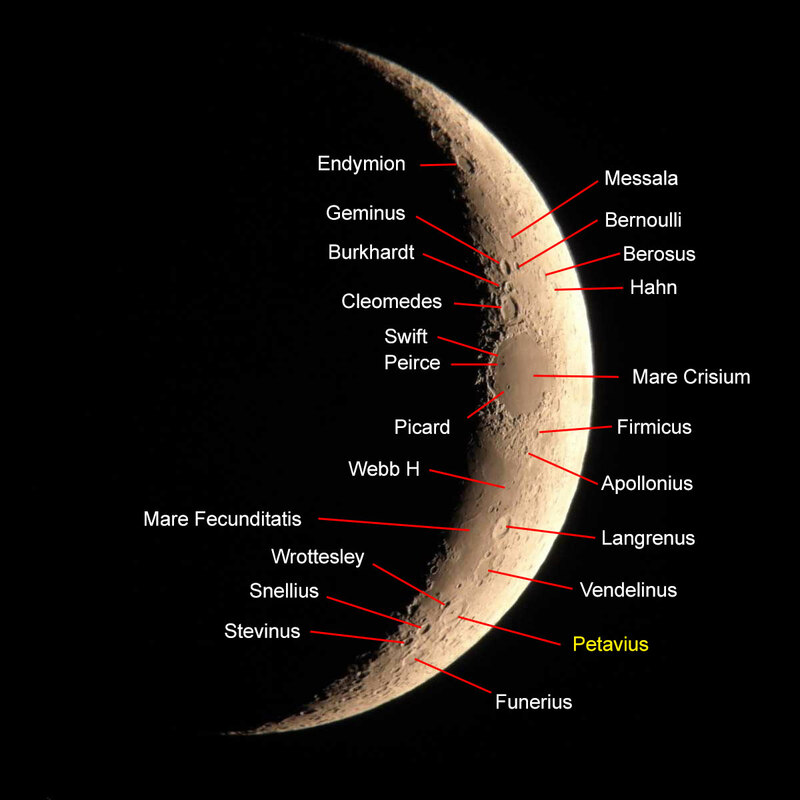 According to Spix & Gasparini it is best seen in the 3rd night after new moon. 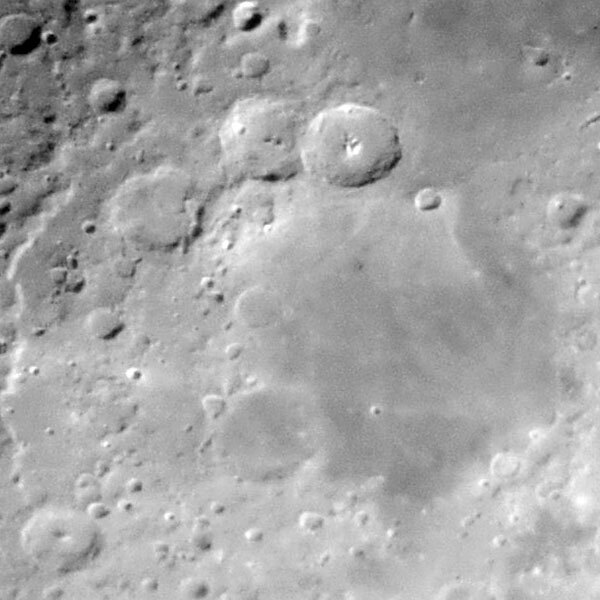 The ring mountains (large crater) Petavius has a diameter of 188 km and a depth of 3300 m (Spix; 177 km and 3300 m altitude according to VMA); it is located at the southeastern edge of the moon. 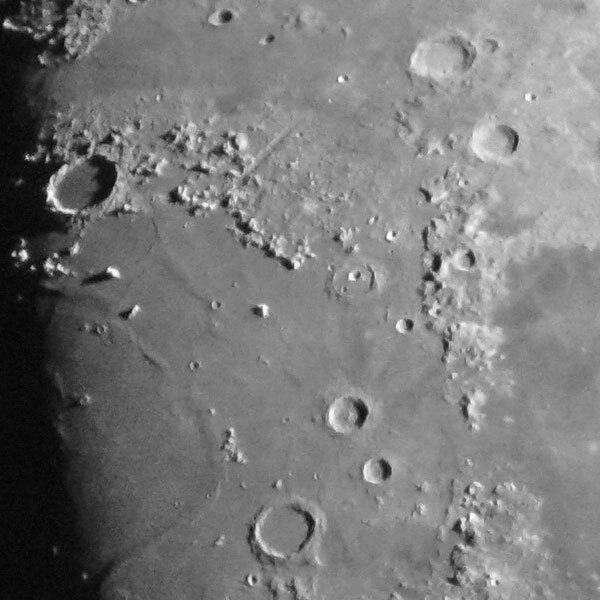 The ring mountains Piccolomini has a diameter of 87 km and is 4200 m deep (S&G; 88 km and 4500 m according to VMA). 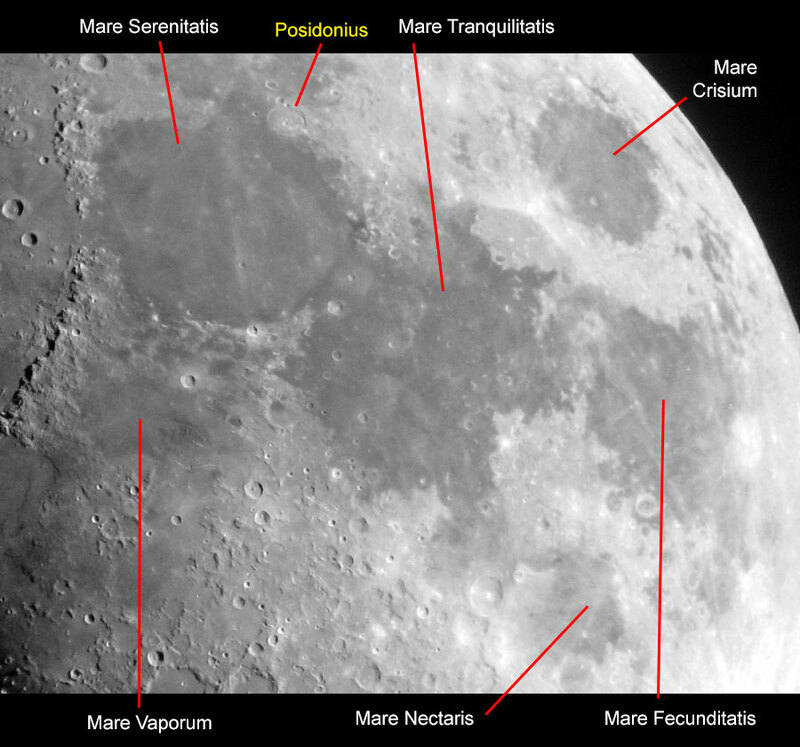 To the north of Piccolomini, you will find a ring of small craters called the "telephone dial." 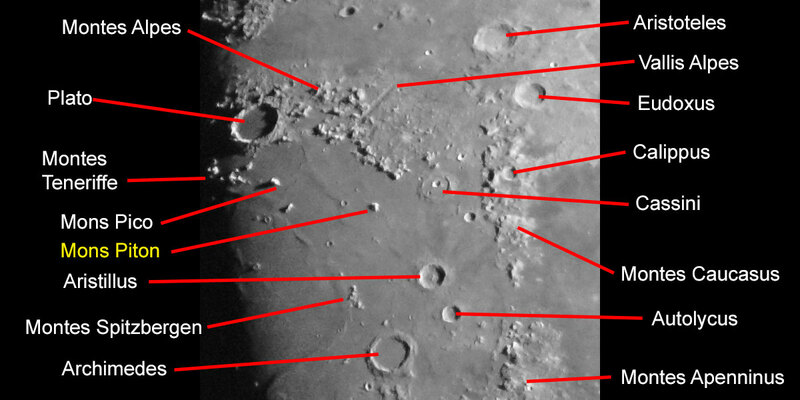 The 2400 m high isolated mountain Mons Pico (S&G, VMA) is located left (west) of the crater Cassini in the northern part of Mare Imbrium (Sea of Rain). The 2250 m high isolated mountain Mons Piton (S&G, VMA) lies southeast of the crater Plato in the northern part of Mare Imbrium (Sea of Rain). 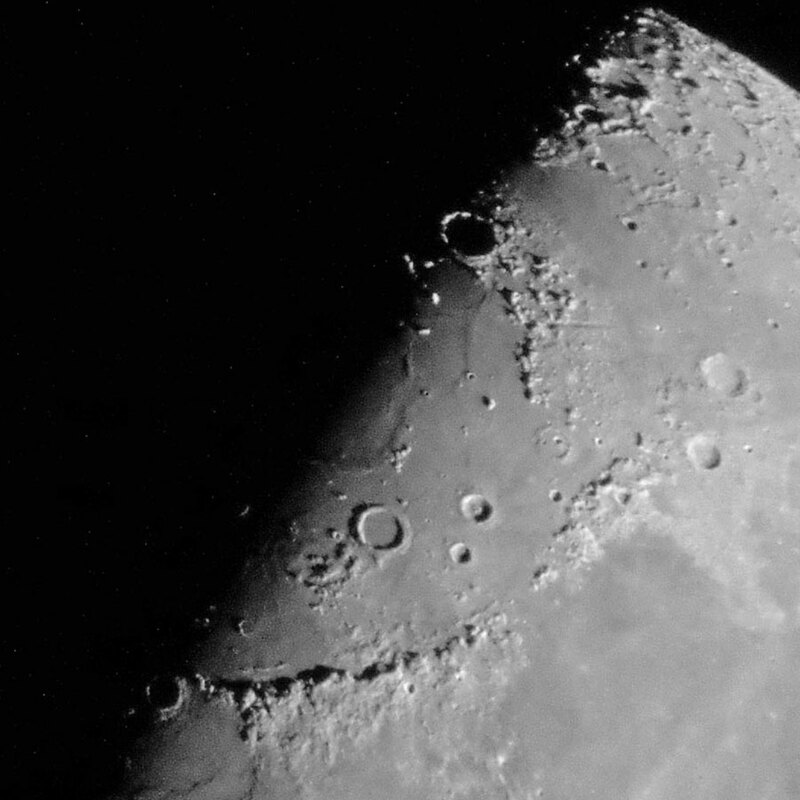 The walled plain (large crater) Plato has a diameter of 100 km and a depth of 2100 m (Spix; 101 km according to VMA); it is located at the northern edge of Mare Imbrium. 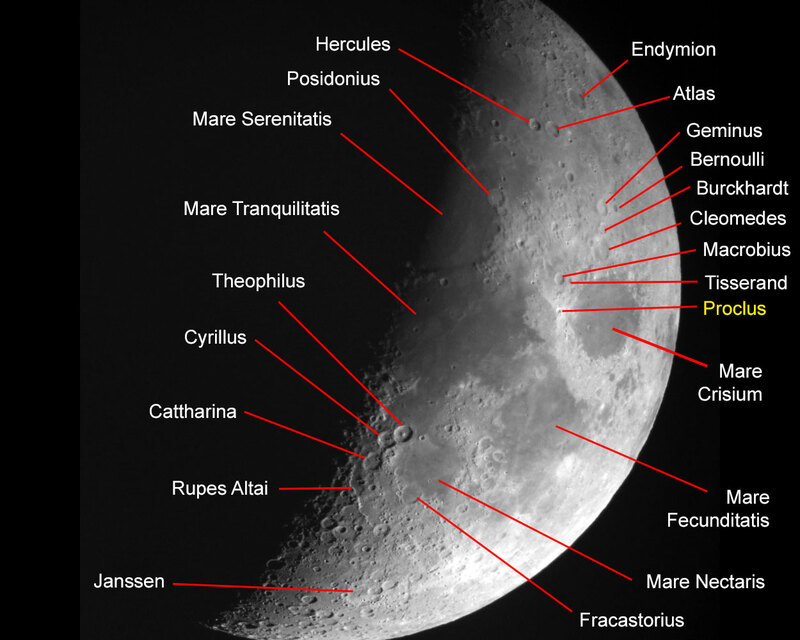 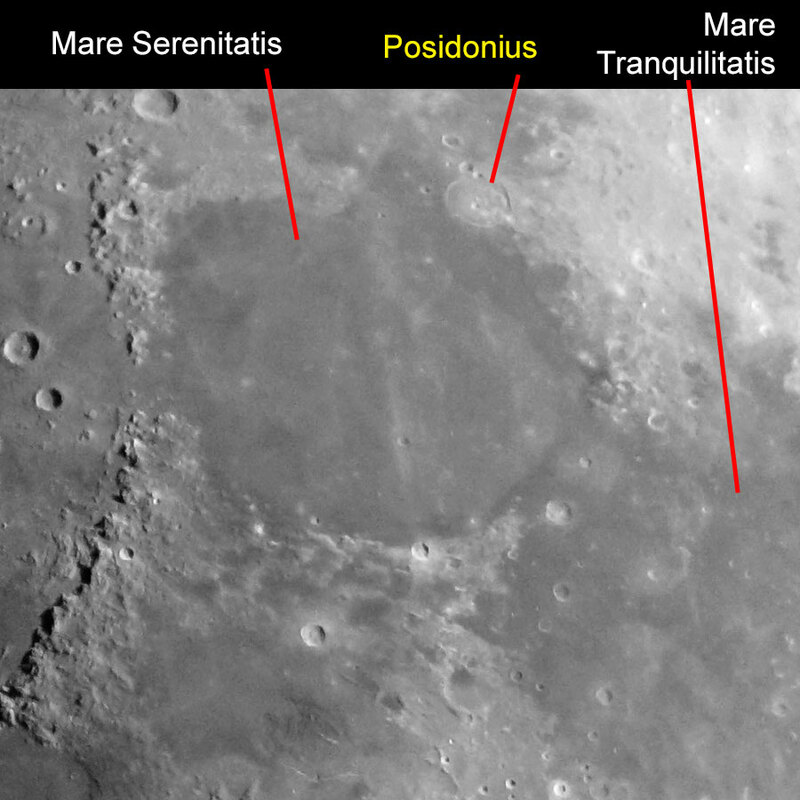 The walled plain Posidonius has a diameter of 100 km and is 1400 m deep (Spix; 96 km according to VMA); it is located at the northern edge of the Mare Serenitatis (Sea of Serenity). 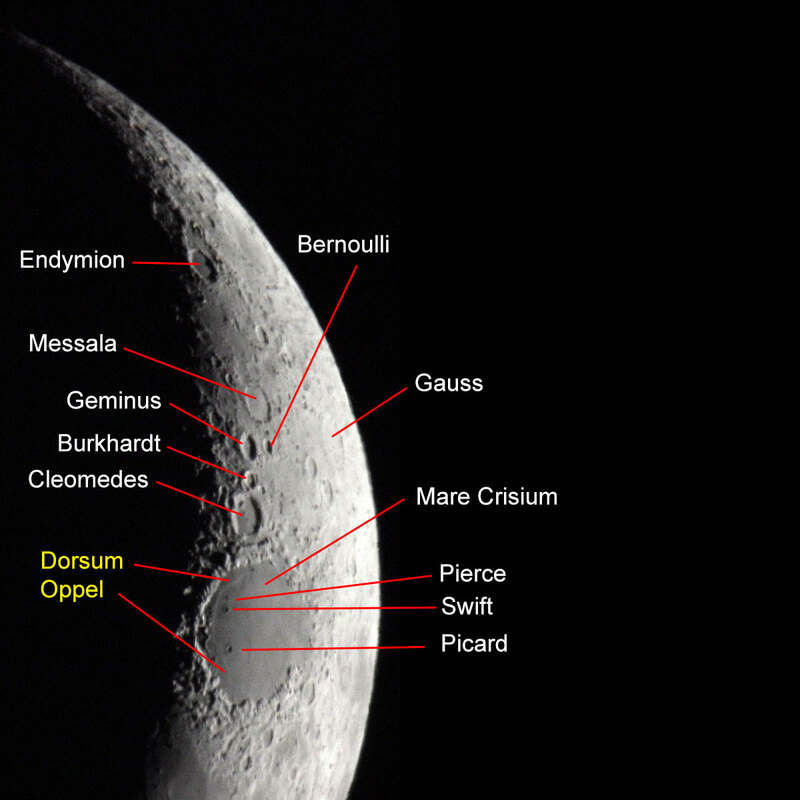 Oceanis Procellarum (Ocean of Storms) has a diameter of 2600 km (Spix) and therefore is the largest sea on the visible side of the moon. 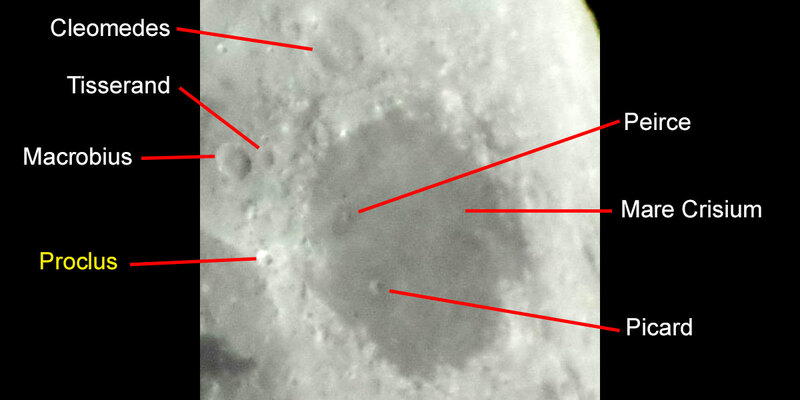 According to Spix, the small crater Proclus (28 km in diameter, 1900 m deep according to Spix; 28 km and 2400 km according to VMA) stands out due to its asymmetrically distributed ejected material; on the lowest photo one can perhaps catch a glimpse of this. 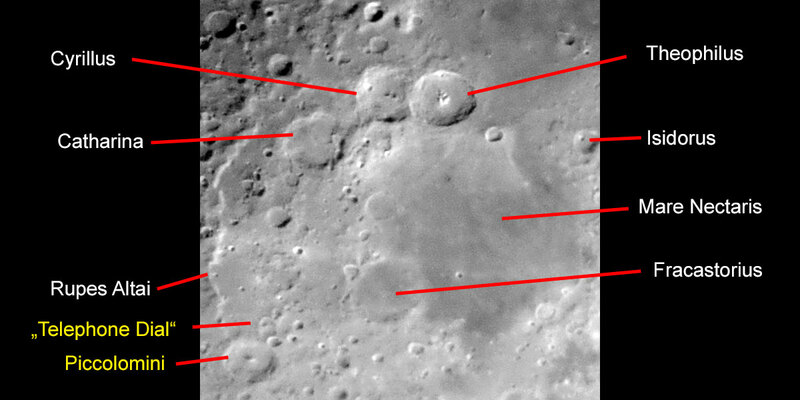 Such a pattern occurs when the angle of impact is very flat. 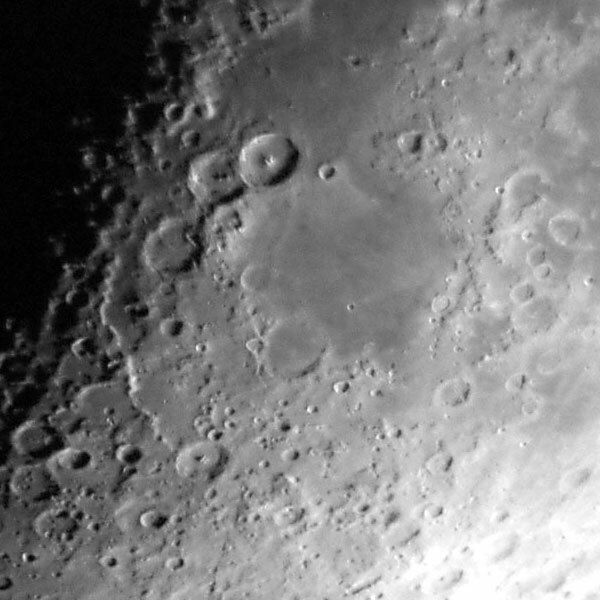 Walled plain (large crater) with a diameter of 153 km and a depth of 2400 m (Spix; 154 km according to the VMA). 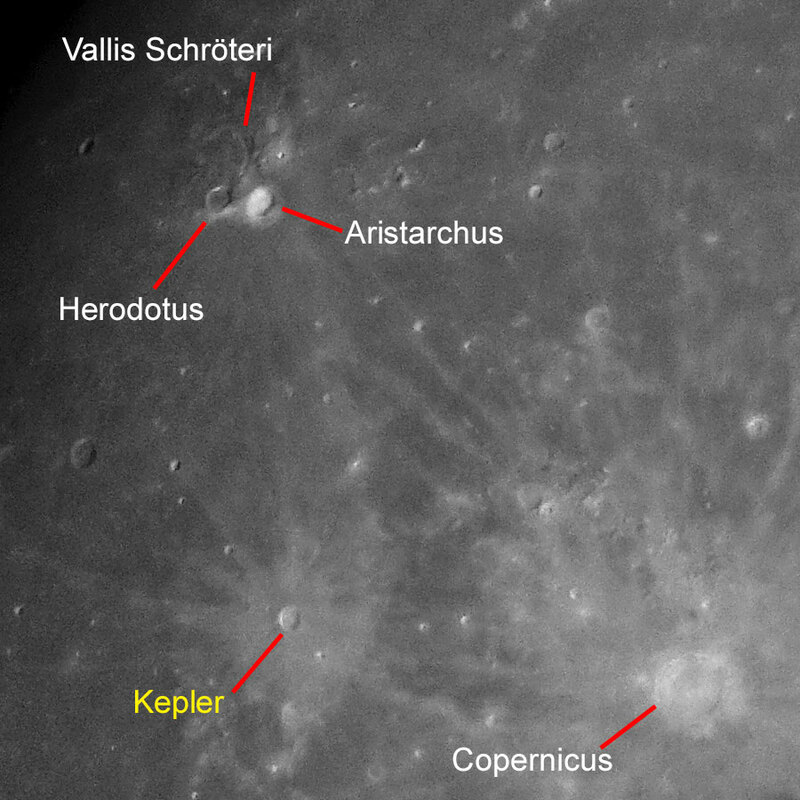 Located north of the craters Alphonsus and Arzachel; together, the three form a beautiful crater chain. 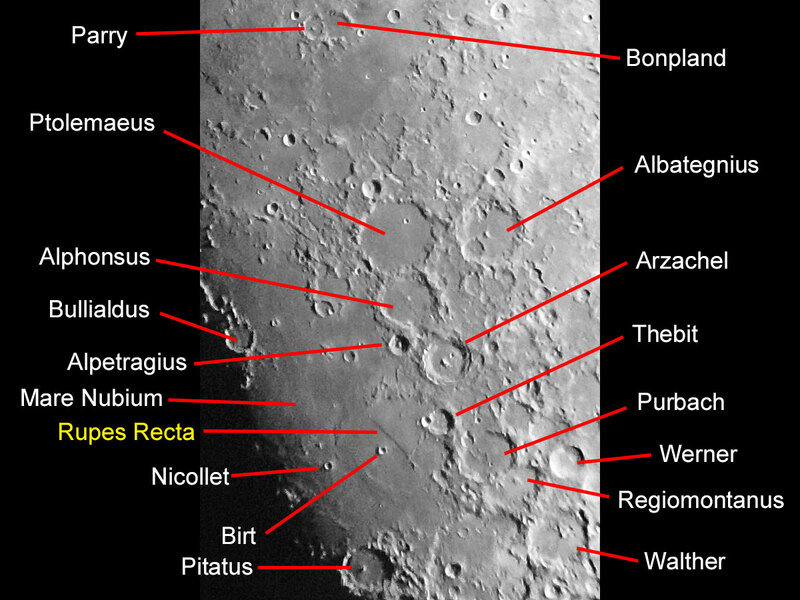 To the right of Ptolemaeus, you will find the walled plain Albategnius. 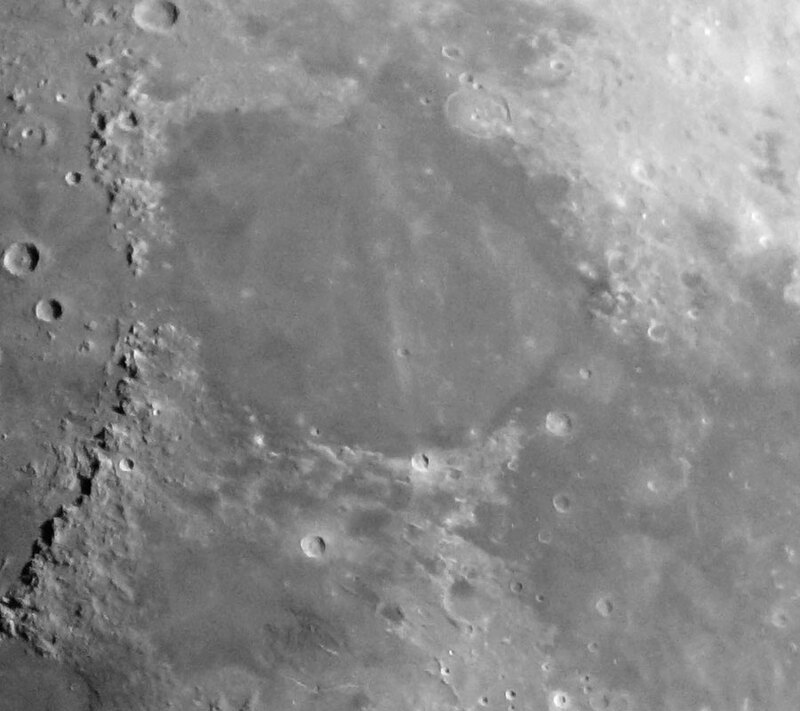 The walled plain Purbach has a diameter of 118 km, is 2400 m high(VMA), and is located north of crater Regiomontanus. 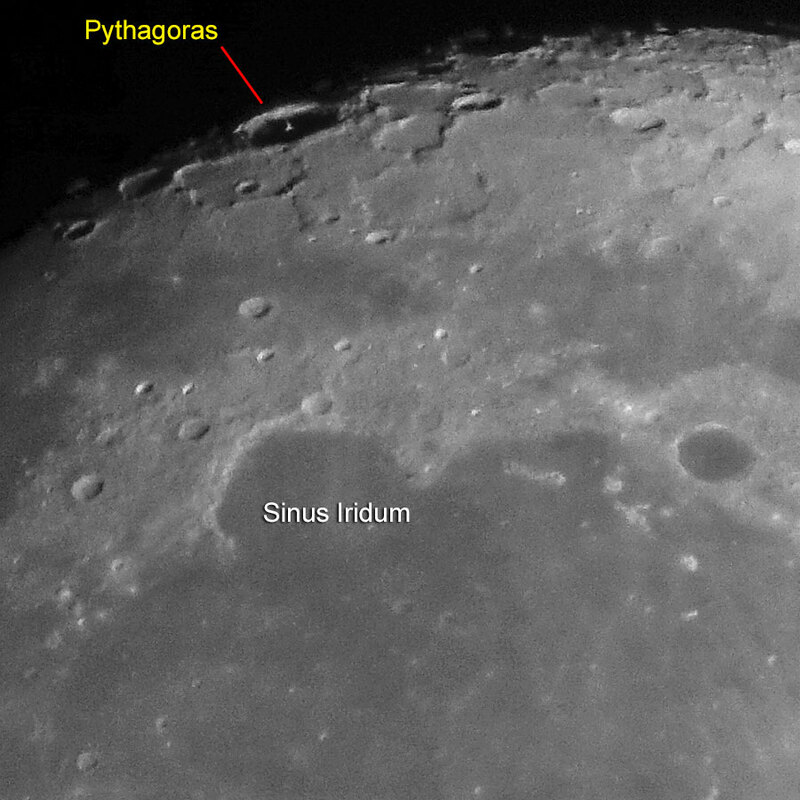 The ring mountains (large crater) Pythagoras has a diameter of 145 km and is 5200 m deep (Spix; 129 km and 4800 m high according to VMA); it is located at the northwestern edge of the moon. 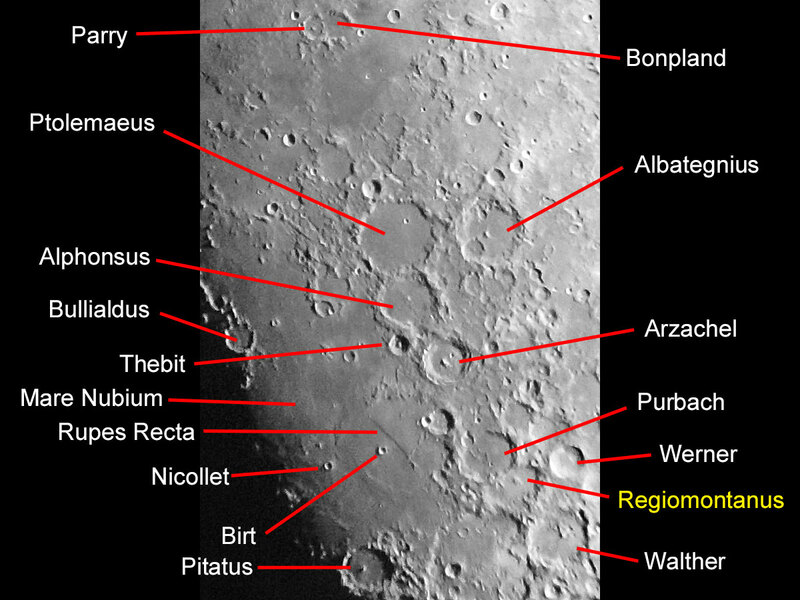 Rupes Recta is a linear fault on the moon, in the south-eastern part of the Mare Nubium. 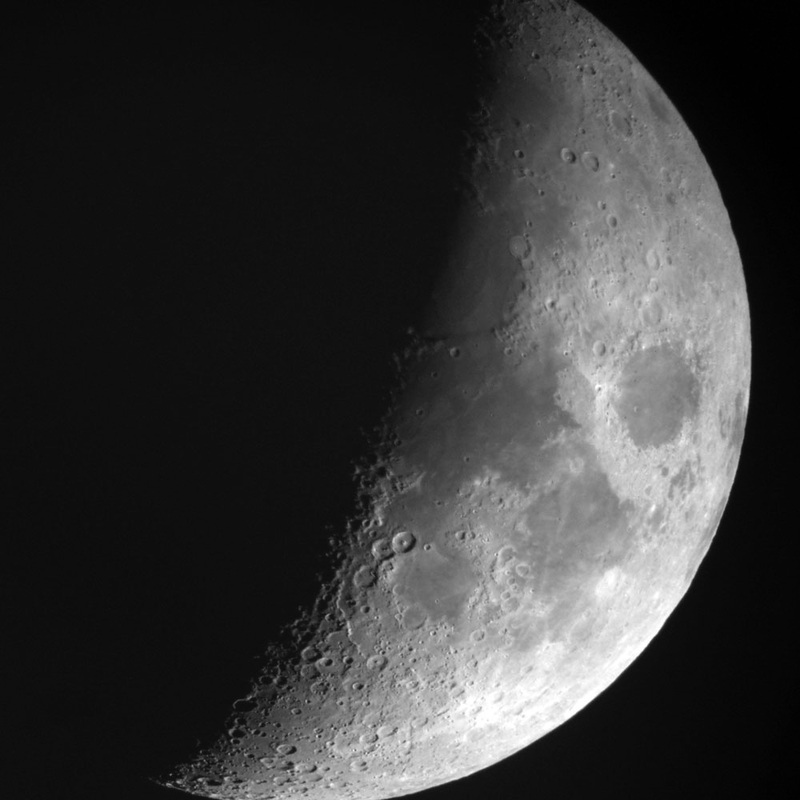 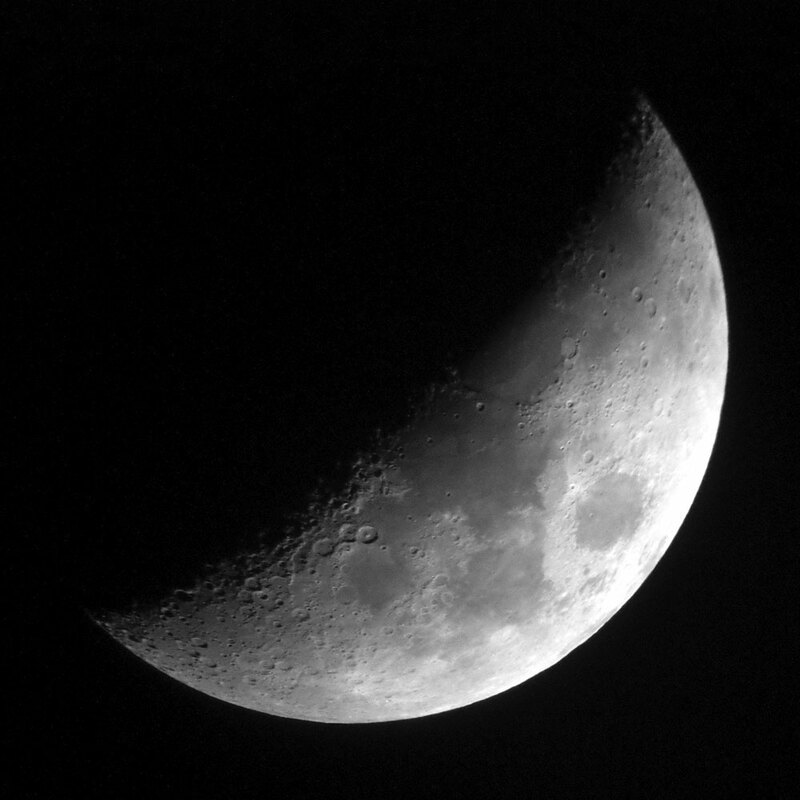 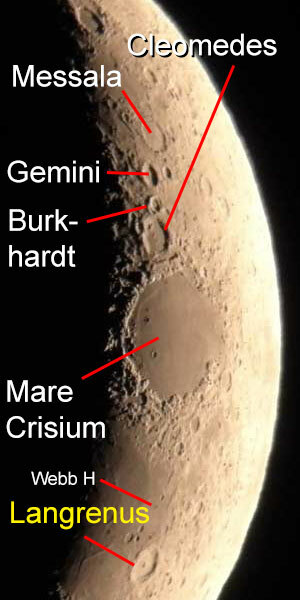 It can already be clearly seen in small telescopes in the grazing light of the half moon thanks to its shadow cast. 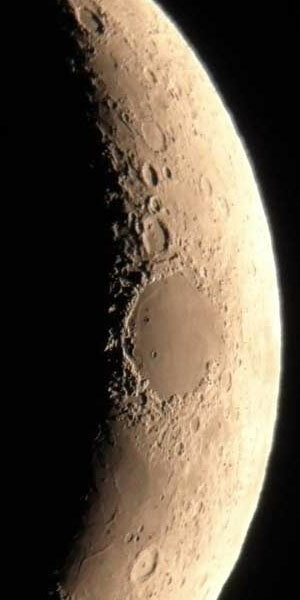 It is 115 km long and 500 m high (Spix). 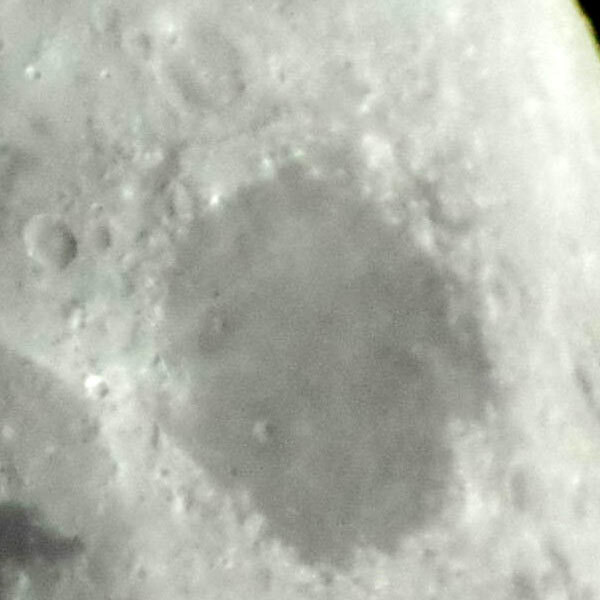 Photo data: March 25, 2018, Sky-Watcher Skymax-127 OTA, Sony RX100 M4 attached to the 32 mm-DigiScope eyepiece. 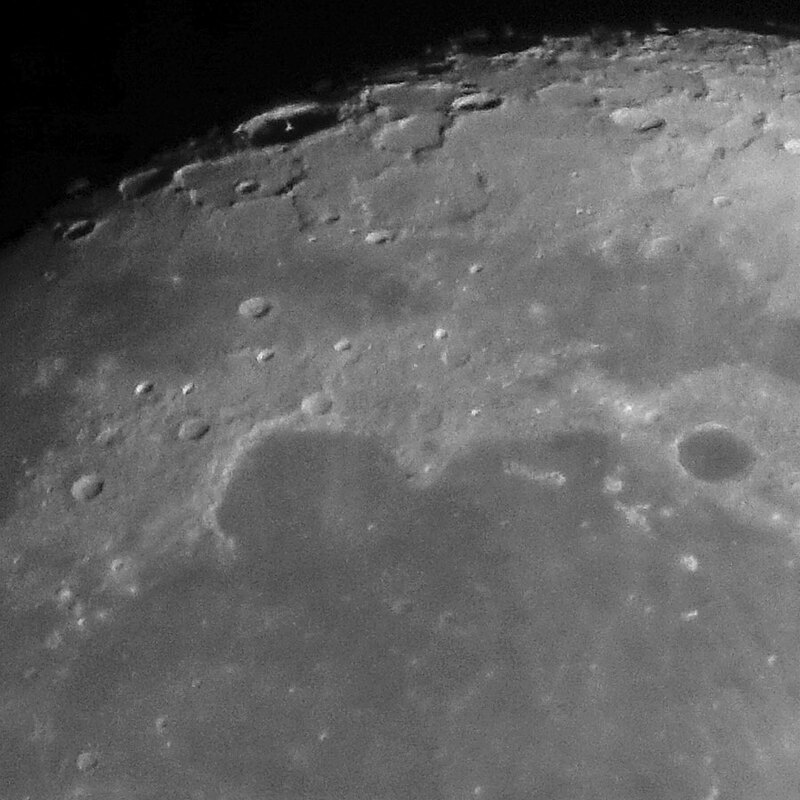 The walled plain Regiomontanus has a diameter of 126/110 km (VMA) and is located south of crater Purbach.